The Island Creek Oysters farm was founded back in 1992 by Skip Bennett in Duxbury, Massachusetts. With a commitment to provide chefs with high-quality oysters, it was only natural that they would open up their very own oyster bar. 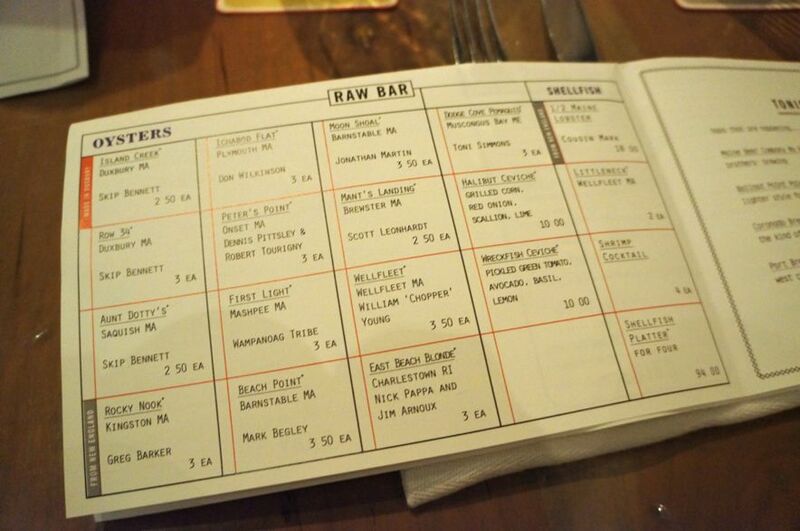 They still supply many restaurants with oysters in and around the Boston area – we noticed Island Creek oysters on many menus. Located a five minute walk away from Fenway Park, this large restaurant has a very sleek and modern interior. The space features high ceilings and a dimly lit dining room. Island Creek Oyster Bar (@ICOBar) is open every day for dinner with lunch served on Saturdays and brunch on Sundays. When we dropped by on a Sunday evening for dinner, the restaurant was packed. If you’re planning on dining here, reservations are key. They fill up fast! The menu here is broken down into apps ($11-$16), soups ($11), fried dishes ($15-$20), lobster dishes ($27-$38), “from the land” dishes ($16-$32) and the day’s fish selection ($25-$45). As you can tell from the prices, a meal here won’t be cheap (especially for Canadians!). 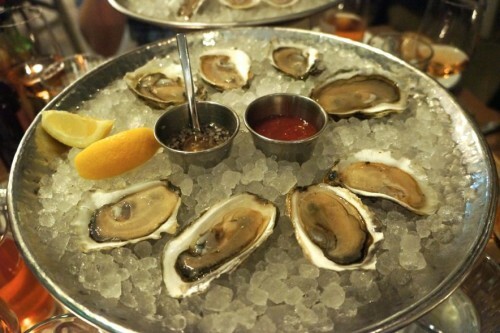 They also offer 12-18 oysters ($2.50-$3.50) each day which changes daily. You can’t come to Island Creek Oyster Bar without ordering some oysters. We ordered several dozens of them amongst the four of us. We’re huge oyster fans – when it came time to ordering dessert, we decided to forgo dessert and order another round of oysters instead. Our server was very knowledgeable in the oyster department and walked us through the day’s selection, providing us with descriptions of each type so we could make an informed decision. 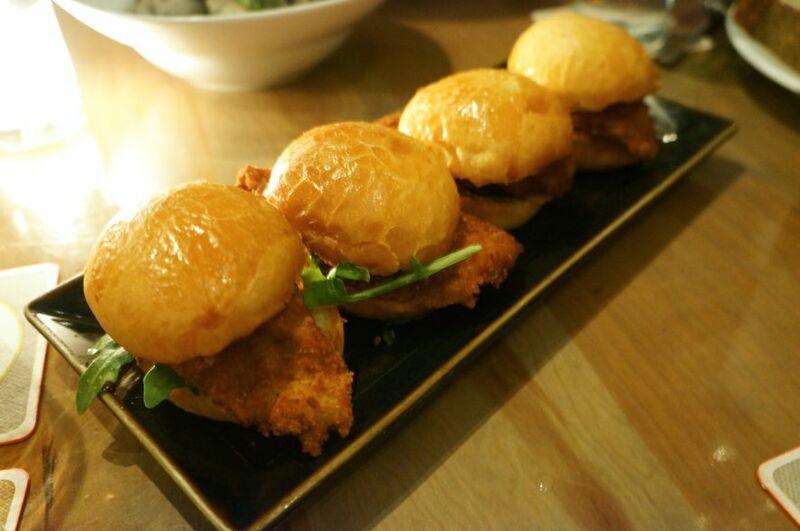 After inhaling several platters of oysters, we dug into our Crispy Oyster Sliders – brioche roll, lime chili aioli ($4 each). Each slider consisted of a flattened crispy fried oyster sandwiched in a delicious brioche roll with a dollop of aioli. There’s no doubt this was a tasty slider but quite honestly, if you didn’t tell me it was a fried oyster, I wouldn’t have known – there wasn’t much oyster flavour at all. Instead of flattening the oyster, I would’ve preferred if they were plump with a crispy exterior and a juicy pop of flavour when biting into it. 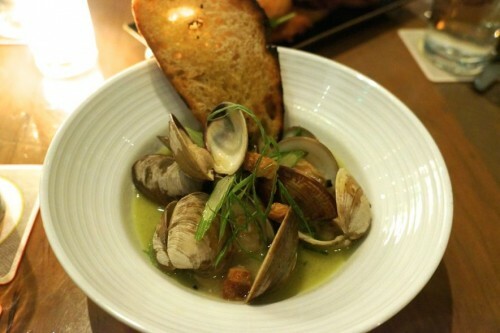 Up next was an order of Steamed Littleneck Clams – bacon, rosemary fennel broth, scallion butter ($15) from the app section of the menu. The plump clams were perfectly cooked and sat in a deliciously light broth. I liked that the fennel flavour was quite subtle. During the meal, they provide you with complimentary bread – definitely use it to soak up every bit of that clammy broth. 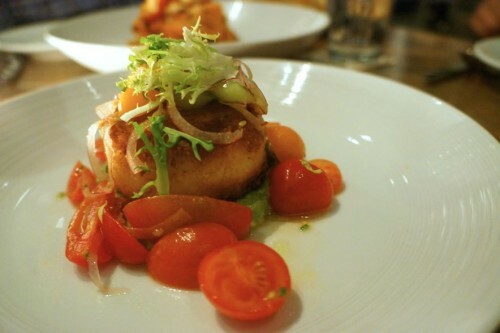 Also from the apps, we shared the Pan Fried Jonah Crab Cake – avocado salad, cherry tomatoes ($16). There wasn’t much filler in this crab cake for us to complain about – just chunks of crab. I loved the combination of the creamy avocado and pops of cherry tomatoes in the dish. It was one of the best crab cakes I’ve had in recent memory! 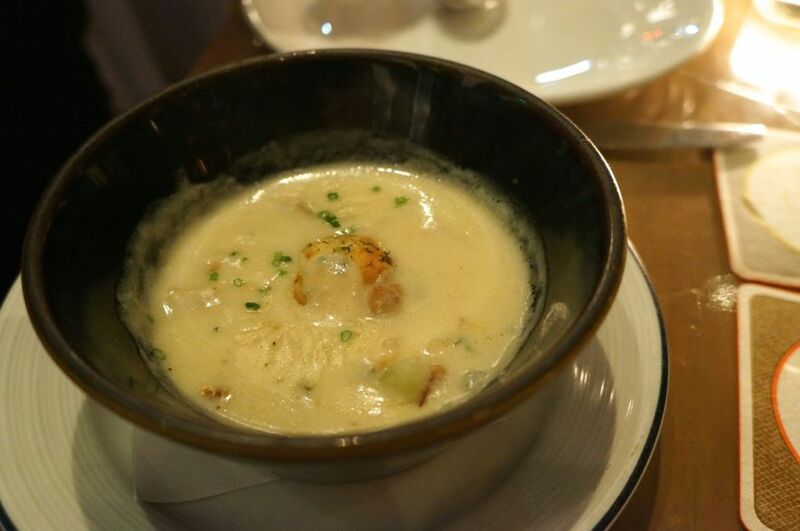 Since we had ordered a lot of food, we all just shared one order of Clam Chowder – hand-dug clams, buttermilk biscuits, house-cured bacon ($11) between the four of us. They were nice enough to split it into two bowls for us (two couples) but I later regretted not getting our own. This was such an incredible clam chowder! It was creamy, packed full of flavour with chunks of clams and smokiness from the bacon. A definite must-order! 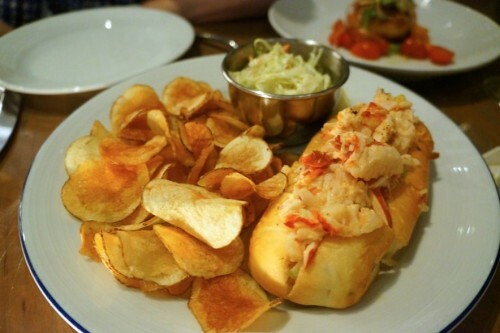 For something more substantial, we ordered Ethel’s Lobster Roll – rosemary roll, coleslaw, kettle chips ($27). Just like Neptune’s, we spent nearly $40CAD on a lobster roll (yikes!). Island Creek’s lobster roll is served chilled with bits of celery and red onion mixed into it. I’m always afraid of lobster rolls drowning in mayo but this one had just the right amount – just enough to lightly coat the lobster. Overall, it was a good lobster roll but Neptune Oyster is still king in my books! The lobster roll also came with a mountain of kettle chips and a side of coleslaw, neither of which were particularly memorable. 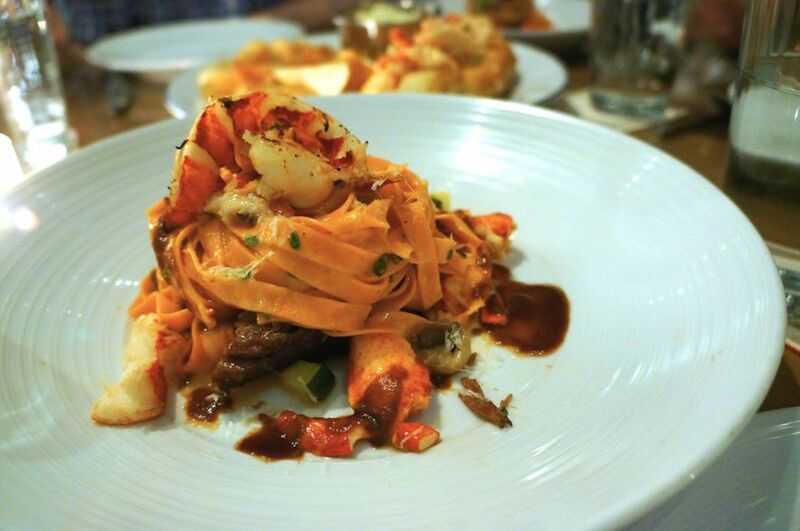 One of Island Creek’s most popular dishes is their Lobster Roe Noodles – braised short rib, grilled lobster, oyster mushrooms, pecorino ($38). On paper, this sounded amazing. After all, I love all of these ingredients. So, I was expecting to be blown away, especially with the hefty price tag. All the components were well cooked – the ribbons of noodles were cooked al dente, the chunks of short rib were tender and the lobster wasn’t the least bit chewy. All in all, it was a good dish but it just didn’t wow me. It just didn’t quite live up to all the hype. However, we still had a wonderful experience at Island Creek Oyster Bar. For the most part, the food was a big hit and the staff were very attentive and knowledgeable. Sure, the prices are a little on the high side but this certainly isn’t an everyday kinda restaurant. You can bet I’ll be back on my next Boston trip!